On return from the tour, I walked along the trail of time to the other side of Grand Canyon Village (not the other side of the Canyon!). 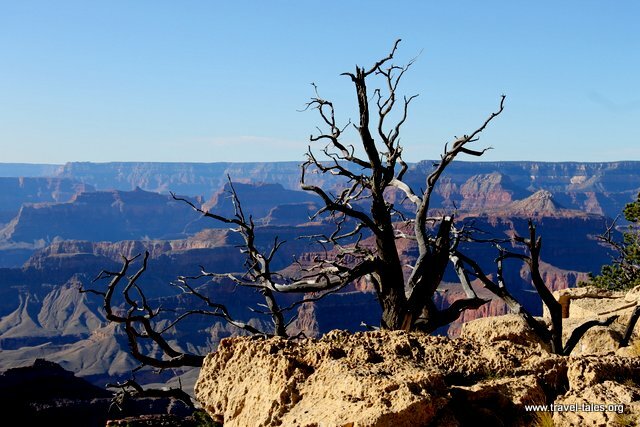 It is the main set of buildings in the South Rim section of the National Park. Only employees of the park or its sub-contractors can live in the village, making up a population of around 300. The Grand Canyon National Park is the only National Park which still has a school; about 20 children graduate High School there each year. The trail through the village is called ‘Trail of Time’ and documents the strata visible in the horizontal layers on both sides of the canyon. I started taking pictures of the stones marking the side of the trail, but I won’t bore you with 33 pictures of rocks. Geologists can leave a comment and I’ll share them with you directly. Both the views and the light falling on the canyon was different and I whittled down the pictures I took across the miles wide chasm to these. Throughout this trip and while going through the photos I took I was constantly reminded about how amazing the human eye is, and the extent to which the camera just doesn’t capture and transmit the vastness and beauty of nature.